The sneak peek for tomorrow's Cinema Saturday Creative Challenge is up! Go and check it out here!! Kristina Werner Color Inspiration Challenge #28 - Birthday wishes! What do I mean by mischief you ask? Well, while I was talking to Brooke this afternoon, she managed to dump out a tube of glitter, take a bite of a candle, dump a container of blank CD-R on the floor, and rip her shirt.... she is quick and I am just not quick enough.... Who needs to go workout when there are a few munchkins to chase around.... No need to worry about getting bored around here! While she was napping, I had a chance to do Kristina's Color Inspiration Challenge. 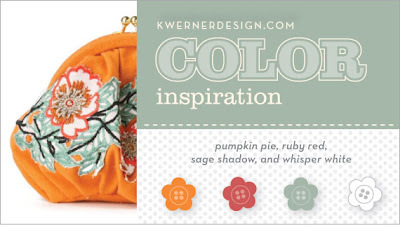 Check out the fun coin purse inspiration that Kristina picked for this weeks challenge. These colors were definitely challenging -but they totally grew on me. I loved the contrast of the bright orange and pink colors with the sage shadow green color. So I thought I would go with a flower theme for a birthday card for my friend whose big day is next week (good thing she doesn't read my blog :) I created the flowers on Photoshop and then cut each of them out - that felt like it took forever - and then adhered them onto the card stock ... and popped some out on dimensionals. I also added a few white brad buttons on a few of the flowers just for a little more white accents on the card. It's always so weird for me to work on Kristina's challenge during the day - kinda throws me off a bit :) Can't wait to go and see what everyone else has created! Don't forget to come back tomorrow for our Cinema Saturday SNEAK PEEK Friday!!! We promise you that our pick for this week's movie inspired challenge - is a fun one!! Thanks so much for coming over for a visit!! Hope your weekend was good - ours flew by. Thanks for all the sweet wishes for our daughter's health - her fever is down a little (she has had a viral fever for the last 4 1/2 days...her doctor seemed to think it is roseola.... I am trying to keep the kids separated so she doesn't get our son sick.... which is near impossible to separate them...). I didn't have much of a chance to craft or comment on your blog - I am sorry about that - but hopefully will have a little more time now that I don't have to constantly hold a sick little baby. 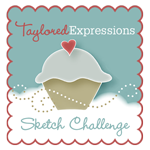 In the midst of all the craziness this weekend - I had a chance to try Taylor's Cupcake Challenge sketch for this week (have you seen the cute stamps that she just released - OMG - way tooo cute!) I love her sketches and this one was no different - loved the circles and bows on the side and couldn't wait to try it for a bday card I needed to make for my friend. The first card is for one of my dearest friends who is working in Berlin now. We went to college and got to hang out earlier this spring when she visited. She is sooo Ms. Vogue - so when trying to figure out what kind of card to make for her, I saw this silver paper from a Project Runway pack (sent by my awesome MIL!). The green paper is from K & Co. The buttons were actually earrings once upon a time which were going on sale for 50 cents! I just figured at that price, I could use it for something! The ribbon is from Offray and the rest is scrap piled. I added some liquid pearls and the stamped sentiment from SU and rounded a corner or two :) Its kinda hard to photograph reflective material so I am sorry about the pics. I also loved Stacy's Jewelry Color Inspiration for this week (she gets her color inspiration from jewelry pieces - how cool is that! you have to go and check her out! )and thought it was perfect for making a Halloween card - I feel like, I should be making more Halloween cards before the season passes me by, so I made another quick one too.The second card was made for our family friends who we are going trick or treating with tonight (yes, you heard me right, tonight.... for some reason, our town has decided that tonight is Halloween... so my son and I are getting all bundled up (it flurried last night!!) and are going with his preschool class (he is dragon - but he tells everyone that he is a sweet dragon :) LOL!) 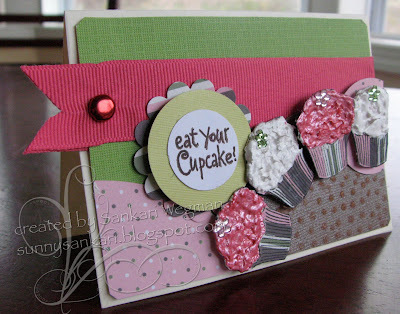 The cupcakes are from Taylored expressions, as are the ribbon and colored cardstock. I paper pieced and stickled and tied some ribbons and called it a day :) The inside sentiment also from Taylored expressions reads: When mummies roam and pumpkins gleam, may sweets be yours on Halloween. The border on the inside was made with a Martha Stewart border punch and then dotted and ribboned :) Aren't those cupcakes in costumes soo cute! I love using them! Hope all of your mondays are going well and that you are staying warm!! 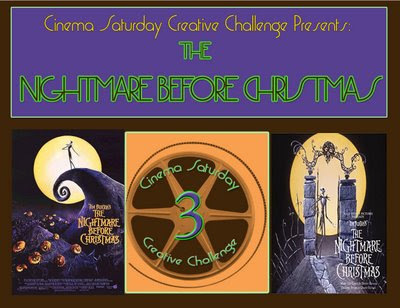 Its time for the third challenge for this week's Cinema Saturday Challenge where we have picked Tim Burton's 1993 movie: The Nightmare Before Christmas! YAY! You know when this movie came out, I was really resistant to watching it because I thought it would be scary and kinda like a horror flick - which I am totaaaaallllly not into and so I didn't watch it for almost 10 years! By that time, I was married and my DH is a fan of Tim Burton and was shocked that I hadn't seen it - and after reassuring me that it wasn't like a horror flick at all - we watched it and to my surprise I loved this movie! It was just soooo clever from the very beginning - it was like being transported into a different world and the most amazing thing was that at some point all these elements were clay!! I love that scene where Jack is singing (I think it is called Jack's Lament) and he is a silhouette against the moon standing on the hill whose edge is a spiral.... so I drew a rough template and cut out some cardstock and painted them different shades of blue, gray and purple and then drew some swirls on them. The black background is embossed with polysparkle EP and then the top edges were corner rounded. I cut out some circles using my CM cutters, crumpled them up for texture and then painted them gold. On the front circle, I painted a swirl. Most of the elements of the card are mounted on dimensionals. We would love for you to play along!! 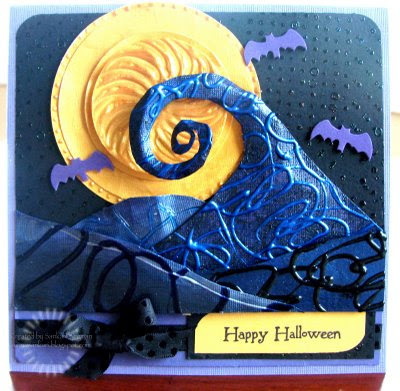 Want to play along but tired of Halloween cards - no worries - you can create anything from the Christmas themes in the movie or the love theme between Jack & Sally ...... or anything in between! Click here to check out our Cinema Saturday Creative Challenge blog. Thanks so much for coming over for a visit! Hope you are all doing well! Things here are definitely interesting.... with one little one who is running a high temp and the other little one who is trying to get all the attention that is going towards his sister - phew! I am sooooo ready for this weekend! Here is a little something to get you excited for our 3rd Cinema Saturday Creative Challenge premiering tomorrow - its definitely a fun movie choice - you can see the sneak peek here ! Come back tomorrow for the unveiling of the third challenge and we hope that you have a chance to play along!!!! 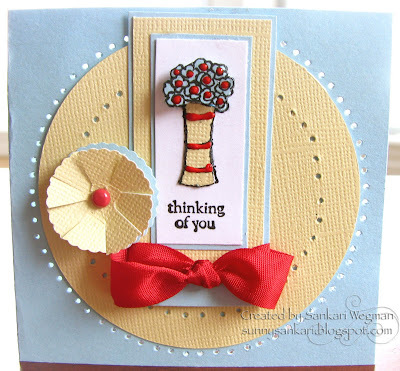 Kristina Werner Color Inspiration Challenge #27- Thinking of You!! wrap!! :) I was cracking myself using this - but it was right next to my table and it was red so I thought why not? It definitely adds a texture to the card and my son has really enjoyed popping what little bubbles were left. Anyhoo.... so I am off to go an snuggle my little bunny - hope all of you are keeping healthy and warm (it is so cold here!) and are enjoying your thursdays!! Don't forget - that Sneak Peek Friday is around the corner for Cinema Saturday's Creative Challenge coming up this saturday!!! Come back tomorrow and check out the fun pick for this weekend! Thanks for stopping for a visit! loved the colors (So Saffron is also one of the colors) for this week - they are so deliciously fall and so lovely and yummy. These pumpkins remind me of something elese: my son's school picture. Today, was picture day at school - it was both hilarious and crazy! My son kept smiling all weird ... he usually does a great job smiling... but his lips have been a bit chapped and so he hasn't been smiling that much the last few days (we have been covering them with all sorts of lip balm). And since he wasn't smiling quite big - they asked him to smile showing his teeth... that is when the craziness started... he started smiling all weird - showing all kinds of teeth ... I kept telling him to smile his sweet smile - but by that point - all he wanted to do was show his teeth in a smile... so he would put his top teeth right on top of this bottom teeth and smile.... he looked like one of these pumpkins...LOL! I have no idea how they will turn out... hopefully there is one good shot .... sigh.. Thanks for coming over for a visit!!! Taylor had a really fun sketch for her Friday Cupcake Challenge - it was to make a project using this layout to find out what your stamps are really saying! I had so much fun with this challenge and came up with a fun birthday card for my son's friend. her mouth :) The sentiment was created on the computer and then cut out and the bite marks on the cupcake were cut out as well. I loved going though my stamps and seeing what fun things they could be saying - and can't wait to make some more cards with this challenge's idea! Hope your Monday is going off to a great start! 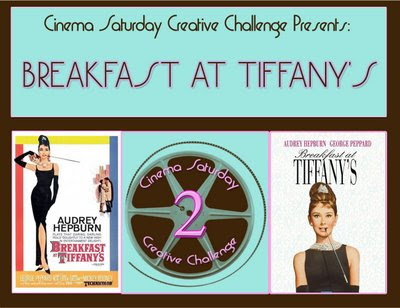 Don't forget to check out the Cinema Saturday Creative Challenge blog (click here) and check out the creations for this week's movie pick: Breakfast at Tiffany's. You can still link your creation to our challenge by Thursday 9pm PST. Well, I am off to make some breakfast! Welcome to the second Cinema Saturday Creative Challenge. Can I even tell you HOW excited I am about today's Cinema pick?!! SOOoooooOOoooo excited! I absolutely love and adore Audrey Hepburn - she is just the epitomy of style and elegance. I grew up watching her in My Fair Lady (one of my father's favorite movies and he presented me with this movie when I was 12 - and I have since watched this movie over 60 times.... I totally know it by heart... and I feel like I have memorized all of Audrey's looks and mannerisms and little gestures. When I finally got to watch Breakfast at Tiffany's for the first time - I was just struck by her effortless grace, beauty and elegance. One of my favorite scenes is the opening scene where the taxi drops her off in front of Tiffany & Co - it is just gorgeous - the way she walks out and the dress! that she is wearing is just so gorgeous - sigh!! she is just beautiful! 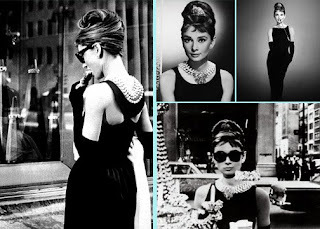 Here is a quick collage of her dress that I made in honor of this opening scene from the movie - she is just so elegant! Well, I can't very well throw out a Tiffany's box, now can I? 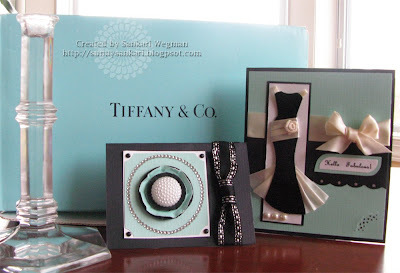 and I haven't found anything extraordinary to store in it - but right now it makes me happy to know that I have a Tiffany's box in my closet, LOL! Anyhoo! 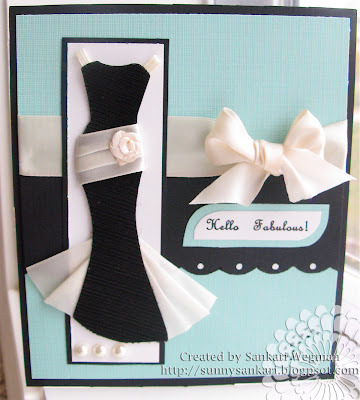 I had to make the cards with that Tiffany blue color in it - so my colors were black, white and Tiffany blue :) This first card that I made is an ode to Audrey's dress in the opening scene. I wish I could say that I made that dress, but I did not.... it was actually from a group of stickers that my MIL sent me a few years back - and I never wanted to use it because it is just too beautiful... and so I was psyched to use it today for this challenge. For this card, I used the sketch from Julee's Mojo Monday #45 - from a few months ago - it is a great sketch and fit perfectly for this challenge. The sentiment was created on my computer and then corner rounded. I made this card for a particularly fabulous friend of mine. 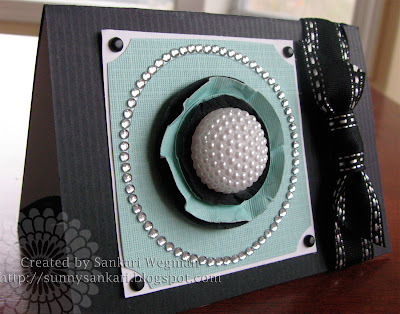 The bottom embellishments are pearls and the scalloped edge was created by a corner rounder. 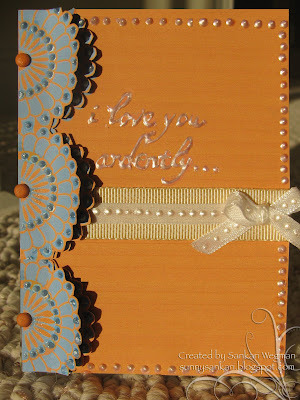 And then after I was done with this first card - I had all these scraps and had to make another card. So I kept it kinda simple - no stamping just adhering all the scrap together. This card was hard to take a pic of because of the diamonds on the circle around the "flower" were shiny and I couldn't capture their glittery gleams in the sunlight . I don't say this often - but I really like how this second card turned out - it was actually the one of the quickest cards I have made because it was basically putting together my leftovers . I have a had this button sitting in my button stash for quite a awhile and was totally psyched to finally use it, as I was to finally use this ribbon from my ribbon stash. 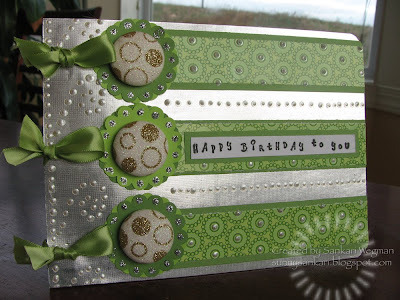 The bling and and brads have been in my stash forever ( I was going to use it for a scrapbook layout and bought it so long ago - but it seemed perfect for this card to honor Audrey's Tiffany pearls and diamonds :) and the cardstock were just the leftover scraps from the first card. Hop on over to Brooke's blog and see her beautiful take from this movie - she always blows me away with her beautiful creations! 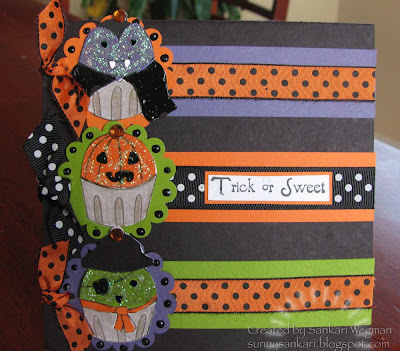 Well, I have to say that I had SO much fun creating these cards for today's challenge and hope that you will come on over and play with us (click HERE). Link your entry to this post anytime from now until this Thursday at 9pm Pacific time. We would also love to hear what movies you would like us to feature on Cinema Saturday and we can't wait to see you creations! C'mon on over and play! Sending you all lots of sunshine! Accessories: Ribbons from stash, button from stash, dress sticker from my MIL not sure where she got i from, bling, brads from Making Memories, corner rounder for scalloped edge, silver gel pen for dots on the border, computer for printing out Hello Fabulous sentiment. Movies watched while making this card: I would like to say Breakfast at Tiffany's, but I watched Pride & Prejudice (1995 BBC version with my lovie Colin Darcy LOL!!! - thanks Anthonette for the heads up that it can be found as mini episodes on Youtube - you have no idea how that totally made my week!!! Just wanted to tell you that you can now get a sneak peek of tomorrow's challenge on Cinema Saturday Creative Challenge - (click HERE). Its from one of my all time favorite movies with one of my all time favorite actresses - and I am so excited for tomorrow! Hope you can join us in the fun and play along! See you at the movies tomorrow!! 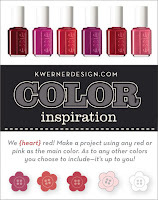 Kristina Werner Color Inspiration Challenge #26 - Happy Birthday!!! But what a better way to get out of the gloom of the approaching winter, than to make a card?? LOL!! Look at this fun set of colors that Kristina Werner came up with for her color inspiration. I love these bright fun colors together - especially because it was raining all yesterday - and this was a bright and sunny palette. 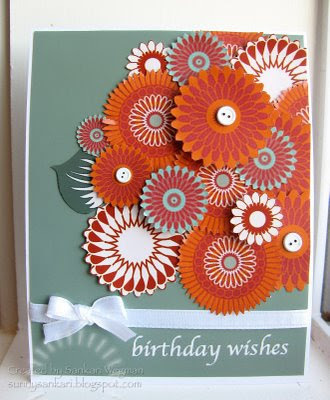 It reminded me of spring and so I went the flower route and came up with this Happy Birthday card. The punched out flowers are adhered to the punched out squares with a brad and then the leaves were cut out free hand and adhered to the flower base. The ribbons were stacked on top of each other - and the bow was made separately and attached with a glue dot. Come back on Saturday and play with us at Cinema Saturday Creative Challenge this Saturday! - you check the details HERE!! Paper: Scrapile (yay!!! the more paper I can use from my scrap pile - the more paper I can buy! Movies watched: Pride and Prejudice (1995 BBC version on Youtube - thanks Anthonette for the tip - I am totally in heaven now!!! I have been slacking on doing some challenges - so today's post is actually three separate posts using 6 different challenges (how crazy is that!) But for the simplicity of listing the card ingredients - I am posting it all separately. 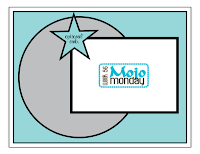 This card incorporates the colors from TCP Tuesday and Julee's Mojo Monday Sketch. I wanted to make a simple card and loved the blue and yellow colors together - so I decided to use the red for accent. (my colors are a little off - because I am trying to use only paper from my scrap pile - but I hope its still okay :) I really enjoyed this sketch from Julee it was totally fun and I have been loving doing circles lately - so this was perfect. I know that Brooke is totally shocked as I am that there aren't any liquid pearl dots all around this card ;) (LOL!!!) I almost did but instead I went the paper piercing route. My hand kept itching to do it - and that's when it hit me: ..... that I am a liquid pearl addict! So I then I had to add some to the flowers... just couldn't help it! LOL! PS - if you need more challenges - please come back on Saturday morning for the all new challenge that Brooke and I are throwing called Cinema Saturday Creative Challenge! We just started last week - go on and check it out HERE!!! We would love love love for you to join! I have been slacking on doing all my favorite challenges - so today's post is actually three separate posts using 6 different challenges (how crazy is that??) 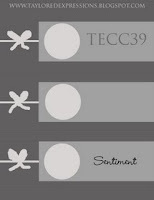 But for the simplicity of listing the card ingredients - they are divided into three posts. 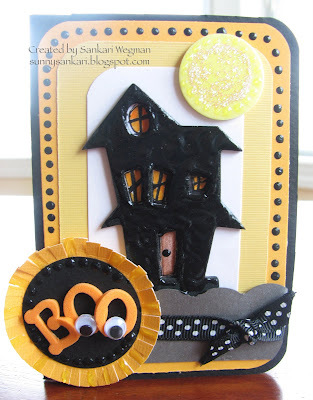 This Halloween card drew its inspiration from Kazan's fun sketch over at 2 Sketches 4 You and my new favorite color challenge from Stacy where she gets her color inspiration from awesome jewelry pieces. 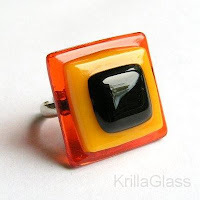 This particular beautiful ring is from the collection of Kristina Moses and you can check out her site HERE). I loved the colors and loved how the square colors from the ring went so beautiful with the sketch from Kazan. 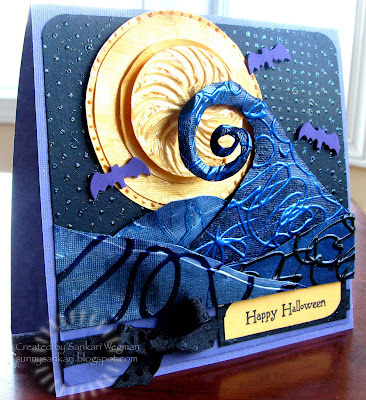 I had to go with a Halloween theme - I tried not to... but still need some more Halloween cards - but I tried to make it boo-tiful (sorry couldn't resist). Its still raining here - and the chai is simmering on the stove :) the whole house smells chai spicy and warm - yummy! Hope you are having a cozy day whereever you are! on doing some challenges - so today's post is actually three separate posts using 6 different challenges (how crazy is that!) But for the simplicity of listing the card ingredients - I am posting it all separately. This card is inspired from the fun colors from the ladies at the Color Throwdown and the sketch from Jen's Sketch for You to Try. 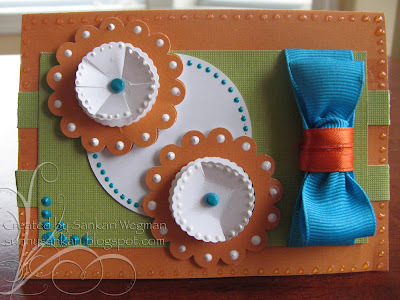 I love these great colors together and decided that I needed some blank sentiment cards - so I just enjoyed the sketch without worrying about the sentiment. This last weekend - I wanted to give a card to someone - and I couldn't find the right card with the right sentiment - so I think I need to make some more all purpose blank ones. I really had fun with this sketch and all the circles. The bow is a tribute to Donna from Butternut Sage designs - who had a great tutorial for this bow - but mine didn't quite turn out the way her gorgeous bow did - so I made do with how it ended up. Can't wait to try out the beautiful colors from today's color throwdown!! Hope all of you are keeping well on this Wednesday! PS. If you need more challenges please come over to our new challenge site called Cinema Saturday Creative Challenge. Every Saturday, Brooke and I pick out a movie from which you can draw inspiration to create a card, layout or project. 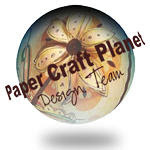 Click HERE for me details - come on over and play - we wold LOVE it if you would join! It's been a crazy busy weekend full of birthday parties and celebrations and laundry and cleaning up. And I am so happy that we launched our new challenge site called Cinema Saturday (click here) where we make cards inspired by movies :) it has been so much fun to see everyone's creations! And one of the nicest parts of my weekend was to have some time alone to play with Taylor's fun sketch for this week's Taylored Expressions Friday Cupcake Challenge! I actually made two cards for this challenge... I started out with one.. but had so much fun - that I couldn't stop at one! I had all these ideas when I saw Taylor's sketch - but the one that really popped into my head was of a scene inspired by the blog header of "Paperlicious . 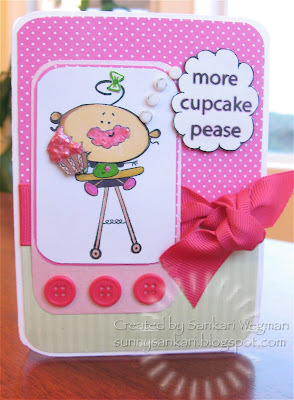 (so Joan, I dedicate this card to you - and thank you for inspiring this card - it is so much fun to read your blog!) It was so pretty and somehow with all the circles - this sketch kinda reminded me of rolling hills and a little tree. 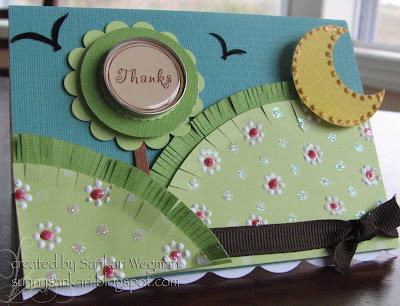 The thank you sentiment was a sticker from Crft Essentials, the ribbon and bow were from American Craft. I punched out the moon with my cicle cutters and then painted some flowers and dots and added some dimension by cutting the paper to look like grass. I totally enjoyed making this card - had so much fun!! 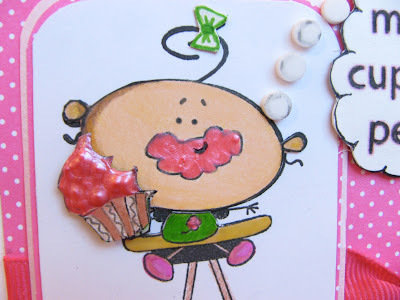 I realized that I had not made any cupcakes in my card for the challenge - and while that is not a requirement - why not use them, if you have them?! So I made a second card using Taylor's sketch using the Hero Arts stamps that my MIL just sent me - how sweet is she!!!! I used the same green paper - and added the other two papers from my scrap pile (it is still a mountain but at least it has three less pieces in it :). I paper pieced the cupcake bottoms onto the image. I first used some liquid applique to create a fuzzy cupcake and then painted over it for some texture with the white and pink paint. I added some bling and then popped everything up on dimensionals. Hope all of you are enjoying your Monday! Thank you so much for coming over for a visit! If you have a chance, check out our new challenge site Cinema Saturday Creative Challenge and join in the fun! Our challenge site: Cinema Saturday premiers today!!!! Click HERE to check it out! This is a site where we (Brooke and I) pick out a movie and then create a card, altered project, scrapbook page etc. from any inspiration from the movie - it could be from anything, like the costumes, the furniture, the dialogue, the colors, the movie cover, the characters, etc. 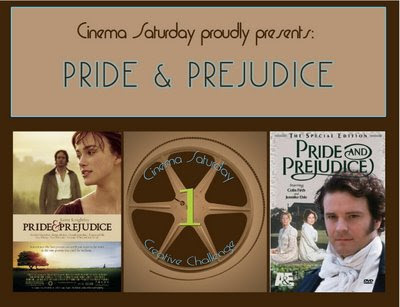 Brooke and I discovered our love for all things Jane Austen and so we had to pick Pride & Prejudice for our first cinema inspiration. I think I have watched this movie over.... 30 or 40 times..... (both versions included!) and then have watched some scenes in particular over and over and over....such as both of Darcy's proposals and especially the Lake Scene with Colin Firth (...sigh..). If you have never seen this movie - you can get more information at Wikipedia, click here to read Austen's novel online, click here for more info about the TV mini series from the UK (starring Colin Firth and Jennifer Ehlie), click here for more info about the 2005 movie (starring Matthew McFadden and Keira Knightly). For this card - I drew my inspiration from Austen's words... I love her use of language - it is just beautiful to read her books and beautiful to hear them on the silver screen. One of my most favorite lines from Austen is the phrase from Mr. Darcy: " You must allow me to tell you how ardently I admire and love you...." I love love love love that line (and love watching Colin Firth delivering them in his first disasterous proposal - click here to watch it on Youtube). The other phrase that I love is from the Mr. Darcy played by Matthew McFadden when he says in the second proposal: "You have bewitched me, body and soul..." (click here to watch it on Youtube). I love these two lines and can merged them together for my card. The outside of the card is kind of hard to read (sorry about that) and it says: "I love you ardently..." and then the inside says: "body & soul". This card was made for my DH who I adore and love and wanted to make him a special card to show how much I appreciate him for all the wonderful things he does for us. At first when I was making the card - I started out with more of a muted green and blue... but somehow it didn't feel... ardent enough (LOL!) - so I switched it to the orange and kept the blue. 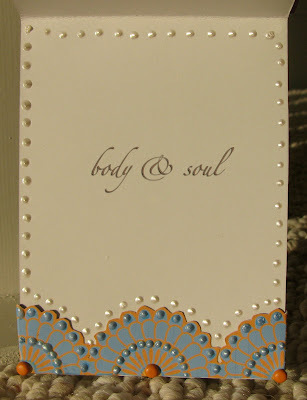 The scalloped edging was made in photoshop and then cut in half and adhered with brads - the same motif was adhered on the inside of the card (where it was already printed out "body and soul" from my computer. In making this card - I watched a lot of Pride & Prejudice on Youtube.. and I feel even more in love with the book and the characters - and I love Austen's language in her book... I have been trying to talk like Elizabeth Bennett's character and have been cracking myself up in the process... Anyhoo - it has been a really fun challenge and I hope that all of you come and join us!!! 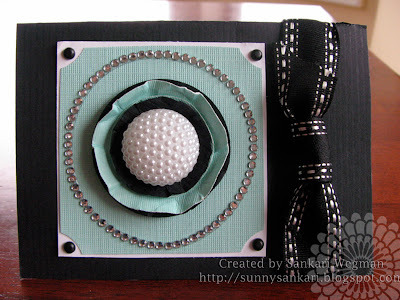 All you have to do is create a card, scrapbook page, or altered project and then link it to the post HERE on the Cinema Saturday Creative Challenge blog by Thursday, October 16, 2008. There is a very special award for the this challenge - read more details on our blog here. Also we have loved getting movie suggestions - so if you have some favorite movies - let us know! Please spread the word! Hope you are enjoying your saturday!! Wishing you lots of sunshine! 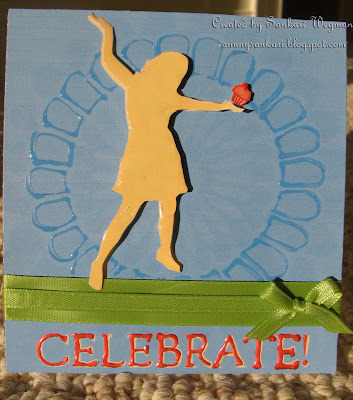 Kristina Werner Color Inspiration Challenge #25 - Celebrate! Anyhoo... 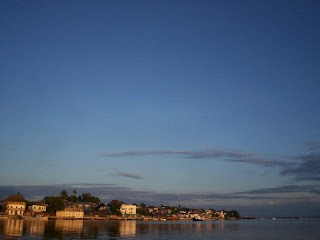 I quickly made this card so that I could take a pic in the last rays of the sun... I am so glad that the weekend has officially begun. Here is my little card of a silhouette lady holding a cupcake (of course there has to be cupcake ... right?) I painted the sentiment "Celebrate" and then glazed it. This is an early birthday card for our friend Julie whose b-day is coming up in a few days and owns the yummiest store in town and has the sweetest heart and smile! Happy Bday Julie! Also in exciting news - our new challenge site: Cinema Saturday Creative Challenge premiers tomorrow - click HERE for all the fun details!! Hope you all come and play along with us!!! Tagged and some Exciting News!!!! - Anything with Johnny Depp.... (he is my first sweetheart :) and my DH is totally cool with dat! -Hum Aapake Hain Khoun (for Madhuri, my most favorite actress ever! - she is gorgeous! - my little spice grinder - I love cooking with freshly ground spices! - my MAC lipstick - always keep one in my pocket - my fave colors are Diva, XS, Viva Glam and Underworld - I seriously LOVE all their products and their lipsticks are just di-V-ine! Any dessert with mango - also Bakalava - my most fave dessert ever! 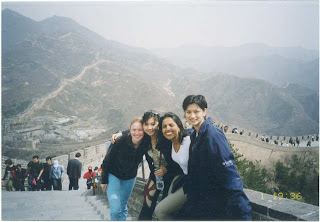 Beijing, China - I was amazed to walk part of the Great Wall - it is seriously huge - absolutely amazing - walking up the steps I would pause to see an amazing view - and then keep walking up more steps to see another absolutely amazing view -- I was stunned speechless - if those walls could talk....... here's a pic of me with some of my classmates at the Great Wall a few years ago. Seelisberg, Switzerland - also known as Heaven on Earth - it is just the most beautiful place I have ever been - the clouds, the lake, the forest, the cows, the chocolate, the air, the love, the sweetness.... the air is so magical there! I can't wait to go back - I have a stack of pics from when I lived there - but they are not digital - will have to scan some ... someday ... the picture that you see is the mountain that I looked at from my class room - it is beautiful in all the seasons - covered with red and yellow in the fall - in snow in the winter and blooms in the spring.... somedays, I would wake up and the lake would be covered by clouds - we were above the cloud-line so all you would see was part of the mountain - it felt like we were floating in the sky - a total magical place! -ginger green tea ice-cream (by Reeds) so good! A huge house for my parents:) here with us in Iowa and a few houses for them to retire to in Rishikesh and Kerala, India and whatever else that they wanted/needed. - I know I should say something for the kids and my DH - but I think I might go with a huge craft room furnished with all the little wonderful things that makes a crafter's heart go thump thump! 1. When the kids and I were driving home from tennis lessons, as we were passing the street that the park is on, a little burst of wind caused some leaves to gently fall in our path - and it was so beautiful to drive through these beautiful fall leaves.... took my breath away! 2. Watching my son's enthusiasm for wacking tennis balls - he cracks me up (and he cracks himself up too!) and watching my daughter (one and half years old) running around the tennis court stuffing all the tennis balls she could find down her shirt :) LOL! 3. Coming home from work and sitting on the sofa with my feet up, laptop in my lap and surfing through the internet.... ahhhhh ... sigh! As for tagging people! I tag all of YOU who are reading this right now! Just let me know that you posted this tag and I can't wait to come over to your blog and read all your favorite things!!!! Well.... onto the exciting news!!! Brooke and I have started our own challenge site !!! Starting on October 11th we hope that you will join us.... at the movies!! 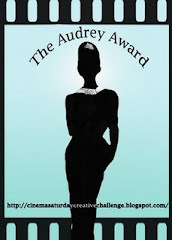 Our new blog's name is: Cinema Saturday Creative Challenge! We thought it would be fun to create cards based on a movie inspiration - so each week - each Saturday to be specific, we are going to pick a movie as our inspiration to create something... a card, a scrapbook layout, a project.... anything! We want YOU! to play along and link your creations to our blog by posting a comment. The creations that cause the most oooo's and aaahhh's will be given a special little award (yet to be revealed!). We really hope that you all come over and play this Saturday!!! Go on and check out our blog (click HERE) - it is still a wee bit under construction - but hopefully things will be up and running by this Sat!!! So please tell all your friends and come on over!!! I am so grateful to have met all of you amazing artists out there doing this blog! My life is so much richer because of it! Thank you so much for all of you who leave amazing comments - you totally make my day! And thank you for all the sweet get better wishes! I think it worked! because today is the first full day that I have felt good the whole day! You guys are the best!!!! Sending all of you a ton of sunshine and happiness!! !